5 different cards with an envelope 6″ x 4″. 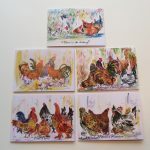 Claire’s original paintings are on a range of cards, suitable for any occasion. Images: Mothers Reunion, Hen Party, Stag Party, Garden Party and Where is she Hiding?